Please use our domain check below on our web site to see if your desired domain is available ! Our offers (marked with *) are valid for the first year of new registration only. A domain or domain name is your personal address at the internet. It is comparable with a physical address. What are the advantages of having your own domain ? Professionell presence on the internet with your own domain name. Your internet service (e.g. web site or web shop) is accessible with your personal domain. By choosing a memorable domain name it makes it easier for people to find you and use your web presence on a regular basis. With your website and your mail addresses you do not depend on a specific provider which is the case in the event of toll-free offers. Your own personalized mail accounts (e.g. firstname@YourName.com) can be set up. Once you have registered your domain name, during the period of registration the domain is owned by you, no one can take it, nor we, your domain registrar partner. The domain owner has the exclusive right of disposal. What does a domain consist of ? A complete domain name consists of, beginning on the right-hand side, root- 0, top- 1, second- 2 and third-Level domain parts 3. All these domain parts are separated with "dot". 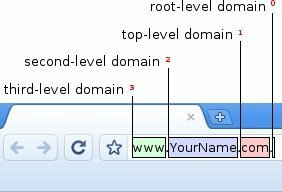 Each domain name commences on the very right with the so called root-level domain but there is no need to list the root level including dot due to the fact that the root-level domain compared to the top-level domain does not have a label. What to consider when choosing your domain name ? Choose a name which describes your business, products or services best. The shorter and more memorable you choose your domain name the better ! At least your choosen domain (mostly a second-level domain part) should be composed of 3 characters ! Upper and lower case letters can be mixed up within your domain name ! That means, related to your marketing plans there is no restriction concerning the typeface that may be used - no restriction just on lower case letters. or international (e.g. .com, .net, .eu, .biz, .info, etc.) target audience ? If you wish that your website is also shown in geographic search engine results then a domain of your country (or in combination with a generic domain) might be necessary. Is the domain name you wish to register already a protected label or brand ? Finally it needs to be checked if your desired domain name is still available. For that purpose please use our Domain Check Service below ! 0 The so called root-level domain is predefined and empty by default therefore also called empty domain. 1 When choosing a top-level domain (Abr. TLD) you are free to choose the domain among the existing standard top-level domains (e.g. com, .net, .at, etc.). 2 For this part of the domain (second-level domain), mostly you have free selection of name (e.g YourCompany, GruberWeb, google, etc.). 3 The third-level domain, often called as subdomain or hostname is free to choose at any time. Mostly standard denominations (e.g. www, ftp, shop, YourService, etc.) are used. 4 Currently, with these domains it is not possible to change the provider. 5 Requires a German residence or an administrative trustee contact who is resident in Germany. 6 Your domain will be transferred from your current provider to Gruber Webservices, just technical contact details are changing. You remain the owner of the domain ! All prices are retail prices and tax free in accordance with § 6 Abs 1 Z 27 UStG 1994.